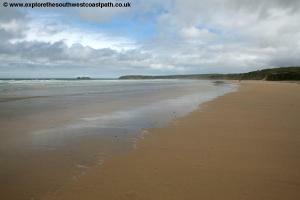 This walk begins by rounding the Hayle Estuary, an interesting area of marshes and river but also with some road walking. 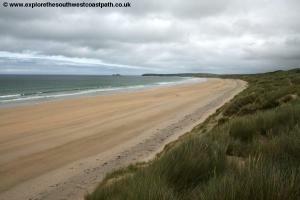 From the mouth of the estuary we then pass the glorious sandy beach of Hayle Towans that runs for a couple of miles to Godrevey Point and lighthouse. East from here the walk is more rocky, passing numerous rocky bays including Hells Mouth to finish in the village of Portreath with it's sandy beach and small harbour. Lelant is on the A3074 which is just off the main A30 at St Erth. Heading towards St Ives, Lelant is the first village you come to. As far as I know there is no car park in Lelant itself so you will have to park on street on an un-restricted road. If you do this please park with consideration for the residents by ensuring the road is wide enough to park on and you are not blocking any driveways etc. An alternative is to use the park and ride at Lelant Saltings station just to the south of the village (well signed off the A3074) which has a large car park with a small charge (pay on entry) - the walk goes past the road leading to this car park anyway. If you are coming by public transport, Lelant has frequent buses on route 14 and 18 between Truro and St Ives and Penzance and St Ives. It also has two railway stations. Lelant station is closest to the village centre but is a request stop only (you must tell the guard on the train you wish to alight) and trains typically only stop early morning and during the evening but not during the daytime. 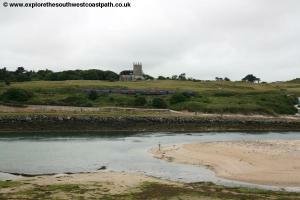 Around half a mile south of the village (and also on the coast path) is Lelant Saltings station. Most trains stop here during the day but some miss Lelant Saltings at peak periods (although those that do usually stop at Lelant instead). Both stations are on the St Erth to St Ives branch line with trains running typically about every 30 minutes. For details of the trains and buses, see the link below. Accommodation in Lelant itself is fairly limited. The Hindon Hall Hotel offers bed and breakfast although they operate a minimum stay of 3 nights during the high summer season which may be inconvenient. The Talwyn Bed and Breakfast is also in Lelant. There is a much wider choice of accommodation in Carbis Bay and St Ives a little further north and in Hayle, which the walk passes though. 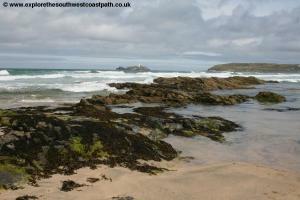 There is a large range of self-catering accommodation in Hayle in particular. From Fore Street in the centre of Lelant head north and after passing The Badger Inn on the right, turn right into Station Hill and head downhill until you arrive at Lelant station with fine views of the Hayle estuary ahead. Turn right here along the minor road (The Saltings) heading south, with good views of the estuary on your left. Soon the trees on your left end and the view opens up with the railway and estuary to your left. Ignore turnings off to the right and keep to this road until it comes to a T-junction onto the busy A3074. Turn left onto this road (there is a pavement on the opposite side). At the roundabout ahead keep left and at the second roundabout turn left signed for Hayle and Park and Ride for St Ives. Sadly the pavements ends along this road, so take care as it's busy. 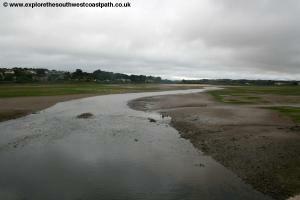 Continue under the railway bridge beyond which you have fine views on the left of the Hayle Estuary. Pass the Old Quay House pub on the left and keep left on the road signed for Hayle. You can now follow the path on the left of this road which despite being a B road is a dual carriageway here. The road soon narrows to single carriageway and you can either follow the rough path along the grass verge on the left side of the road, which is next to the estuary or cross and follow the pavement on the other side. 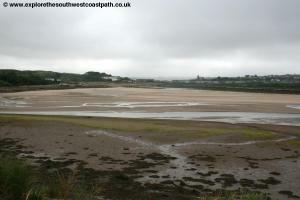 Ignore the turning on the right for St Erth (and also The Hayle Estuary Nature Reserve) and continue beside this road. Soon after this the pavement continues on the opposite side of the road. As an aside I never understand why councils decide to suddenly move the pavement to the opposite side (and usually, as here, with no crossing provided). Soon you pass some warehouses on the left and just beyond a sign welcoming you to Hayle. A short distance past this sign you turn left on the signed footpath. 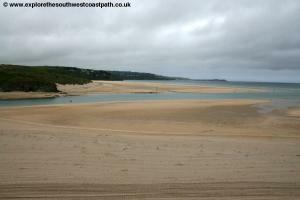 This goes behind a row of houses and offers fine views over the Hayle Estuary. A short distance after you pass the last of the houses there is a footpath signed right back to the road as you start to enter an industrial area. Take this, ignoring the path that continues beside the estuary and return to the road adjacent to an old building (part of Jewson) and turn left and follow the pavement beside the road, with the road to your right. Pass the main entrance to Jewson on the left and soon the road approaches the impressive viaduct ahead, carrying the railway over the road and stream. 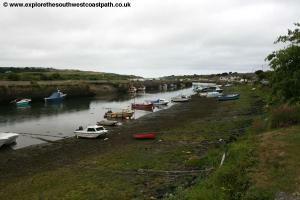 The official route of the coast path is to continue to the roundabout just past the viaduct and take the first road on the left, however instead there is a new path built in front of the viaduct so just before you go under it, turn left and follow the path beside the viaduct and through a little garden to the main road opposite Boots, where you rejoin the official route. Turn left here and keep the road on your left. 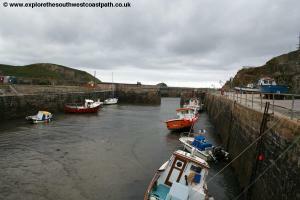 On the left you now heave pleasant gardens that border the harbour, with it's attractive boats. Continue past the last of the shops on your right and Philips Pasties on the left. Continue beside the road as it turns to the right (you may find it easier to walk through the car park of Philips, since the pavement on the left side of the road ends here). Pass the blue painted pub on the right (The Royal Standard Inn). Shortly after this on the left hand side you can see the road leading over what looks like an old metal railway bridge (signed for Swimming Pool). Cross this bridge using the footpath just to the right of the road. Keep on this path passing adjacent to the swimming pool (which is a small outdoor pool) and then turn left on the road (North Quay), with old railway tracks in the road. This rather odd road heads through an industrial area (and you may find lorries turning here) but it is the correct path and you keep the estuary to your left. After passing the gravel extraction works on the right keep going ahead signed for the beach car park until you reach the public car park at the end of the beach, Hayle Towans. Here you have a choice once more. The official route of the coast path is to turn right on the track leading from the right edge of the car park past the buildings and chalets of the holiday park and keeping close to the sea on your left. An alternative is to turn left through the car park and through the dunes to the beach and then turn right, keeping the estuary and see on your left. 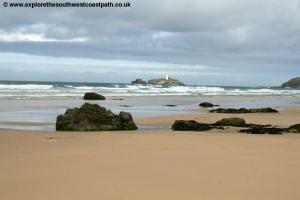 Whichever way you choose the route soon opens up to the beautiful St Ives Bay with miles of glorious sandy beach ahead. 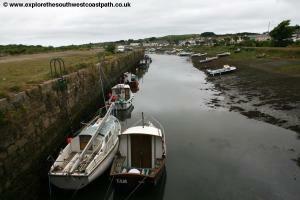 If you stick to the coast path pass the various wooden buildings of Hayle Towans. It soon comes to a road with three buildings on the left. Pass these buildings and turn left and keep to the cliff top path. 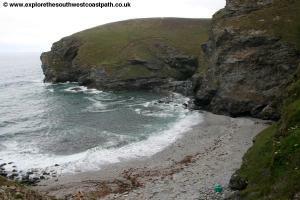 There is again access down to the beach but the path continues along the cliff top. 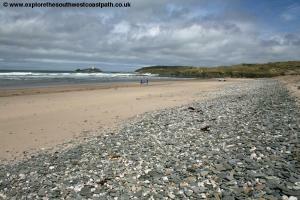 If you are walking along the beach, simply keep along the beach with the sea to your left. 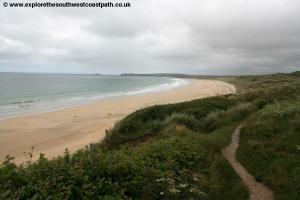 Soon you pass the many caravans of a holiday park on the right and then the path enters a huge area of sand dunes. The coast path becomes more difficult to follow here, as it follows various wooden posts marked with yellow arrows in the dunes, but seems to keep randomly heading away from the coast. 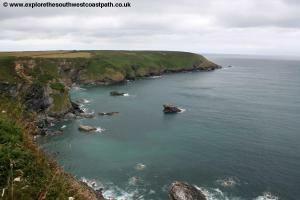 My recommendation is simply take on of the well-walked paths that follows as close as possible to the coast and you can't go wrong. 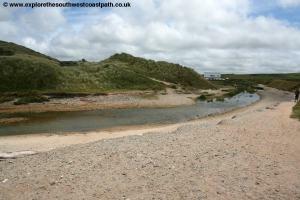 Soon you pass the Beachside Holiday Park in the dunes to the right. 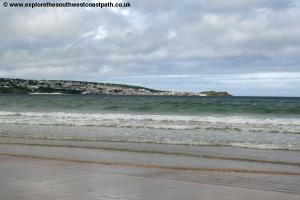 Continue passing another holiday park and the Shore Surf School on the right. The path keeps ahead into a more worn area of the dunes and the official route again heads a little way inland from the beach. If you are walking along the beach you may wish to return to the official route here, depending on the state of the tide. Prior to this there is always sand even at high tide but a little north of here the beach is completely covered around high tide so if you are not sure or if the tide is coming in, take to the coast path again, as the sand dunes on the right soon give way to low cliffs, making it harder to join the official route. Follow the wooden posts through the back of the dunes and again if in doubt keep to a path close to the coast through the dunes. Soon the path continues through the dunes on top of the low cliffs and you keep to this until you reach a car park, this time Gwithian Towans. 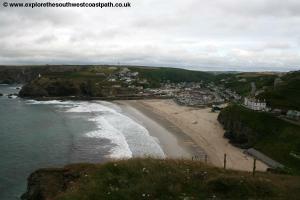 Continue through the car park on the cliff top as it descends back down to the beach level. 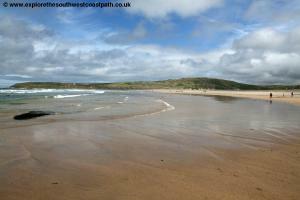 Here you have another excellent beach backed by a mixture of dunes and various little ponds. The beach has some shingle and pebbles at the back of the beach. If you are using the Ordnance Survey Map at this point there is an inconsistency in that the Orange covered Explorer map shows the coast path following the high tide mark, whilst the pink Landranger map shows the route as heading inland here to the road and following the road for nearly half a mile. Don't do that, but instead follow the beach at the high tide mark. As you reach the cliffs at the north end of the beach there is a stream running over the sand to the sea with cliffs beyond. Turn right just before this stream and follow along it's edge with the stream on your left to a footbridge which crosses it and then once over the stream, turn left and then follow the track up the cliff to the National Trust car park and cafe. On reaching the car park turn left and follow the road leading from the car park as it heads left back to the cliff top. The coast path generally follows this minor road (although there is a brief section on the left you can leave the road), but it's a very quiet road as it only leads to a car park. Just past the car park you have the beautiful Godrevy Cove to your left and can enjoy fine views all around St Ives Bay and back to St Ives itself. 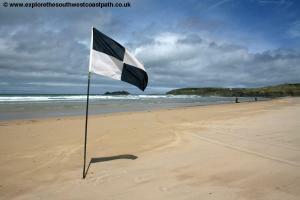 At the south edge of this beach the road turns to the right - do not take this but continue straight ahead on the coast path. This heads out onto Godrevy Point the very north end of the bay with Godrevy Island, with it's lighthouse just off the coast. 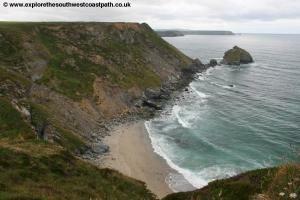 The remainder of the walk to Portreath is now along the cliff top passing mostly rocky beaches. 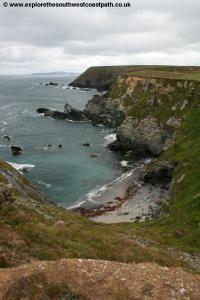 After rounding the head you have the small cove of Mutton Cove to your left although there is no access to the beach. Keep to the obvious cliff top path now heading east. 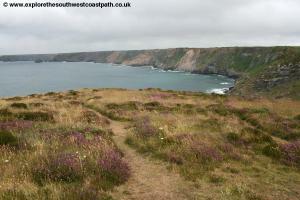 At the next headland, Navax Point the coast path is the wider of the two tracks and the more inland of the two tracks and it's recommended to keep to the official route here as the other paths tend to stop and leave you having to head through heather and gorse. Once round the headland the path keeps to the coast as you turn to head south and passing two lovely sandy beaches, Castle Giver Cove and Fishing Cove although there isn't access to either from the coast path, sadly. Keep to the now wider track along the cliff top. For the next couple of miles the coast follows very close to the B3301 road that goes along the coast and there are several cliff top car parks off this road. There is also a bus service during the summer that goes to St Ives (via Lelant) if you wish to cut the walk short and also to the end of the walk at Portreath although it is not very frequent. Just after the second beach (Fishing Cove) the path forks, take the left most fork (the right most heads to the car park and road). 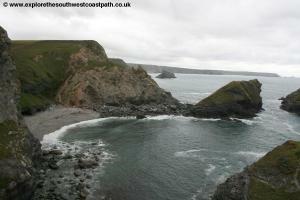 Follow this path around the cliff top and back to the road where there is another car park just to the right. This is Hells Mouth, a famous beauty spot on this spectacular part of the coast and you have fine views to the rocky cliffs below. 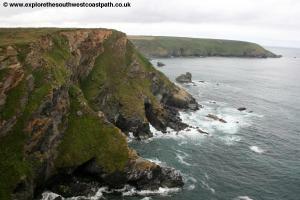 Continue along the obvious coast path along the cliff top as it crosses Hudder Down and soon runs very close to the road. There are several car parks along the cliff top here and part of the coast path has even been designated as a wheelchair usable path for one stretch. After you pass the fourth of these small car parks on your right the road heads a little away from the coast and you continue on the obvious coast path along the cliff top. You pass Greenbank Cove on the left, that has some sand at low tide although again there is no access to it from the coast path. Continue past Crane Islands, a couple of rocks just off the coast and round to Basset's Cove, where there is another cliff top car park. This is another sandy beach at low tide and unlike the other beaches access is possible to it, although it's not especially easy and not really recommended. 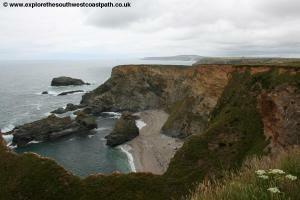 Follow the path from the back of the car park and turn left to rejoin the cliff top. You soon have a very steep descent down to Carvannel Downs where you descend down the steep valley and then back up the other side. The path zig-zags for a time until you reach the top of the hill and then continue on the cliff top path to another good beach, Western Cove, with lots of rocks just off the shore. There is however no access to the beach. During the summer months a bus (number 547) runs a few times per day from Portreath to Lelant operated by Western Greyhound. Otherwise there is a regular bus from Portreath to Camborne and Redruth from where there are trains back to Lelant. For details, see the link below. Ordnance Survey Explorer maps 102 (Lands End, Penzance and St Ives) and 104 (Redruth, and St Agnes) cover this area of the coast path and are available from most book shops nationwide and many local shops. 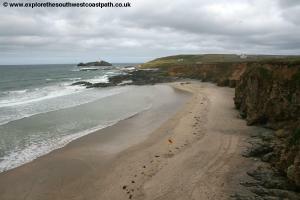 Streetmap is a web site which provides maps of the UK, including the area between Lelant and Portreath. 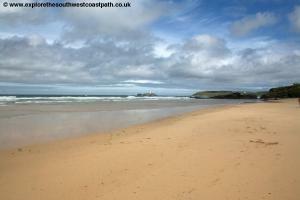 The links below cover the coast between Lelant and Portreath.